Arrival at the Zvartnots International Airport and transfer to hotel. 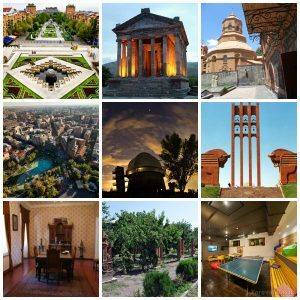 City tour of Yerevan – one of the ancient capitals in the world – 29 years older than Rome. Welcome dinner at a traditional Armenian restaurant. Travel 18 km west of Yerevan to the city of Echmiadzin.Visit the UNESCO heritage sites of Echmiadzin Cathedral -the mother church of the Armenian Apostolic church, then on to 7th century St. Gayane and St. Hripsime churches, the church of Shoghakat (1694). Have a delicious lunch at Machanents cultural tourism and art center in Echmiadzin and continue to archeological site of Zvartnots– another UNESCO heritage site and one of the exquisite landmarks of medieval Armenian architecture, although mostly destroyed by a powerful earthquake in the 10 th century. Visit Megeryan Carpet Museum to see beauliful Armenian handmade carpets, learn the history of carpet weaving and watch weavers work on their patters. Dinner in Megeryan. Mother Cathedral of St. Echmiadzin. Travel to Aragatsotn province to see the 13th century Saghmosavank Monastery. Continue to the monument of Armenian Alphabet then on to Gyumri – the second largest city of Armenia. Visit the Dzitoghtsyan museum of Social Life and National Architecture. Dinner and overnight in Gyumri. 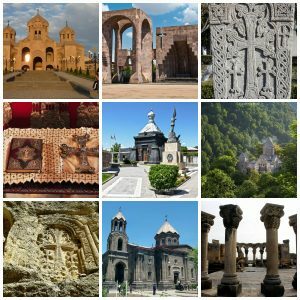 Travel to 13th century Haghartsin monastery located in Tavush province of Armenia. The province is often compared to Switzerland for its picturesque mountains, green forests and alpine meadows. Then travel to Dilijian – a town known for its resorts and mineral water. Continue to Lake Sevan-the largest freshwater, alpine lake in Eurasia, located at an altitude of 1,900 m above the sea level. Visit Sevanavank complex located on the peninsula of Lake Sevan. Return to Yerevan. in the cave”). Return to Yerevan. Free time for shopping.